The renowned Strofylia forest is situated in the north-western section of the protected region and is the most extensive Pinus pinea in Greece and one of the largest in Europe. 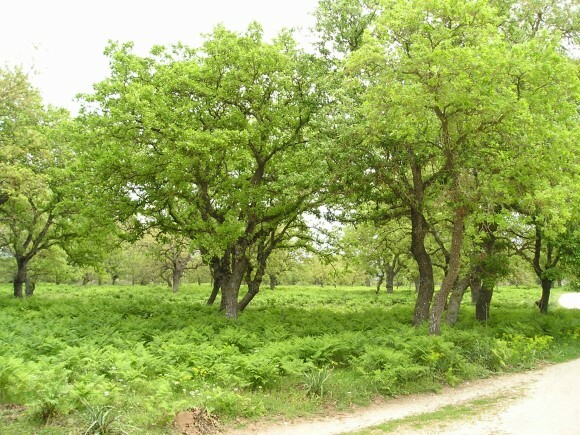 Strofylia forest has a total area of 2,200 hectares, covers a coastal forest strip with an average width of approximately 1,250 metres with small or large spaces and clearings. There is stagnant water with natural or artificial canals on its eastern and southern borders, which contribute in forming a sequence of wetlands (with fresh water and brackish water) and terrestrial habitats. This sequence creates an ecosystem with a huge biodiversity. Strofylia forest is comprised of three dominant tree species, the Pinus pinea, the Pinus halepensis and the tame oak (Quercus macrolepis). The Pinus halepensis occupies the largest area and mainly appears along the sandy beach and dunes, while the interior of the forest is comprised of mixed clumps with the Pinus pinea as the dominant species. The Pinus pinea occupies a smaller area and is mainly found in the eastern section of the forest. Finally, the tame oak (Quercus macrolepis) occupies a very small area in the eastern section of the forest and appearing alone or in mixed clumps with the Pinus pinea. The Pinus pinea that is known for its edible fruit is a sensitive species with restricted Mediterranean coverage. One often encounters it in the low lands near the sea, since it has a preference for sandy or sandy clay soils. 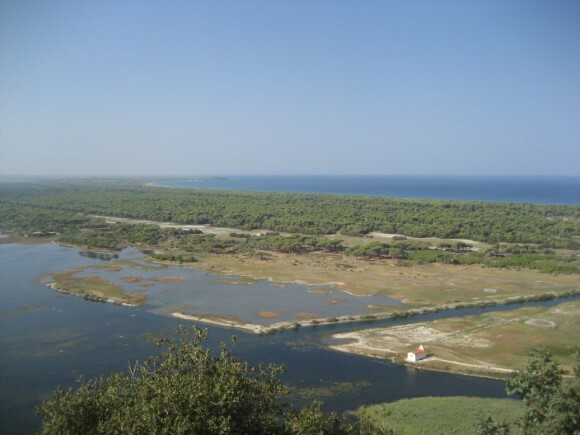 The greatest number of the Pinus pinea trees in Strofylia is found behind clumps of Pinus halepensis trees, which grow all the way down to the sea. This protects them from the strong winds and the salinity of the seawater. The majority of the Pinus pinea trees that are encountered in the forest are aged between 100- 200 years. 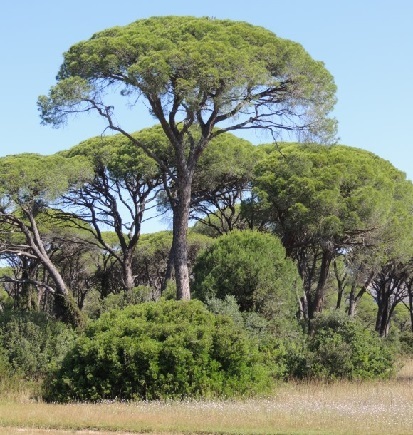 The Pinus pinea has encountered natural regeneration problems in recent years and its reproduction is accordingly assisted with the planting of young seedlings. Some of the other species that are encountered in smaller numbers are the wild pear (Pyrus amygdaliformis), Pistacia terebinthus, Juniperus phoenica, holly (Quercus coccifera) and the flowering ash (Fraxinus augustifolius). The forest does not have continuous shrubby undergrowth. It only develops at places where the forest canopy is broken according to the specific conditions and is comprised of species making up maquis vegetation or brushwood. 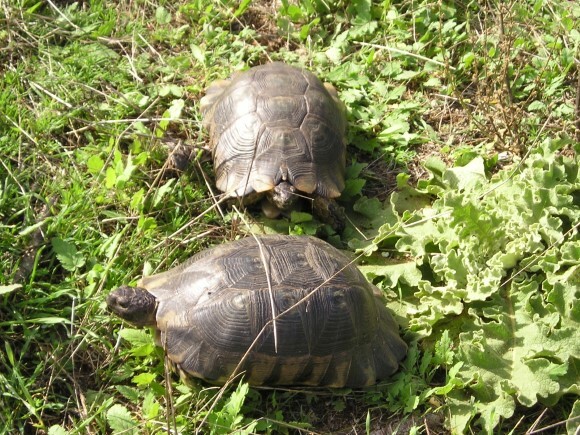 Strofylia forest provides refuge for terrestrial turtles, foxes, weasels and tree mice together with many birds such as the cuckoo, long-eared owl, Phylloscopus, and others. Living and dead tree timber also provides a micro habitat for a variety of insects and mushrooms that play an important role in recycling forest matter.